petition: Save Le Marché St. George! Save Le Marché St. George! 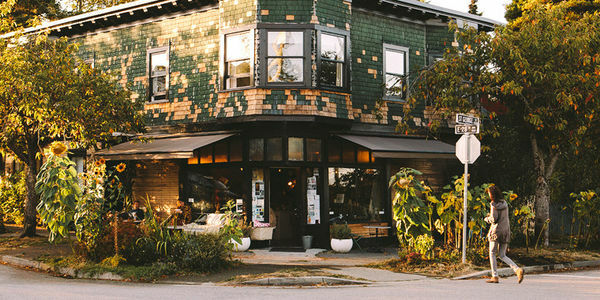 Le Marché St George is a corner store, a café, a meeting place, and a home. It’s a husband, wife, and daughter, a sister, a best friend, an aunt, 3 chickens, 2 cats, a fish, and 2 bee hives who live here. It's a place where everyone is welcome. It’s seeing the neighbourhood kids growing up together. It's love stories that have lead to happily-ever-afters. It’s where the mothers and fathers come to relax with their kids. It’s first dates and first babies. It's running groups and knitting groups, community vineyards, and mariachi bands. It's keeping spare keys to the neighbours houses. It’s honest people who work long hours. It’s a funky, handsome, all-crooked, old building where all of this is happening... and we want to keep it that way! Unfortunately, due to outdated city by-laws defining what a "neighbourhood grocery store" is, we cannot be who we are and who we've been for the past 5 years. Help us change the city's mind and show them what these kinds of places mean to their neighbourhoods and communities! This Friday, city officials will potentially restrict Le Marché St.George's outdoor and indoor seating and our ability to serve food. These restrictions would effectively close Le Marché St. George because the business would not be able to generate enough revenues to stay open. The current by-laws only allow neighbourhood grocery stores to sell cigarettes, magazines, lotto tickets, and junk food! Help change these outdated by-laws by signing this petition. Please allow neighbourhood grocery stores, like Le Marché St.George, to have 'Limited Service Food Establishment' licences, in order to succeed and serve the demands of their communities. We will never be able to say enough Thank You's for what has happened this week! The incredible support and dialogue that came from this event may bring significant change to the future of these little shops and particularly ours. The City of Vancouver has said that we may CONTINUE OPERATING AS WE HAVE BEEN while they work with us to sort out the zoning and by-law issues. Thank you EVERYONE for speaking up! We are forever grateful.